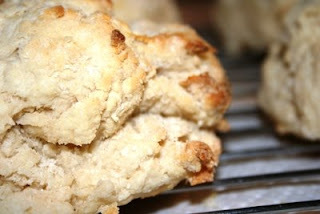 As a southern girl, it has always been a source of embarassment to me that I can't make home made biscuits. My daddy can make them, and other southern cooks I admire can make them, so why can't I?? 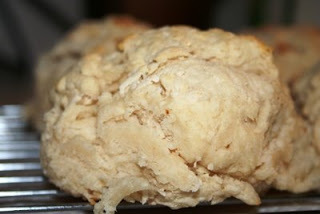 I was flipping through some of my cookbooks the other day, looking for an overnight french toast recipe, when I found a simple-looking recipe for buttermilk cat head biscuits. It only had 3 ingredients. How hard can that be? I decided today was the day. I set out to conquer my fear of home made biscuits. I measured 3 cups of self rising flour and sifted it into my favorite mixing bowl. I measured approximately 4 tablespoons of shortening and worked it into the flour with my hands until the mixture looked crumbly. This took a little longer than I thought it would, but, whatever. I made a well in the middle of the flour and added the 3/4 cup of buttermilk called for in the recipe. It didn't form the soft dough the recipe said it would. I actually added more than twice the amount of buttermilk, but I figured because the air is so dry here, that's probably normal. Anyhoo... I worked the dough for a VERY short time, then shaped it into 7 huge biscuits. The recipe was supposed to make 12, but I wanted REAL cat head biscuits. I put them close together on a greased sheet pan and baked them at 500 degrees for probably about 12 minutes. 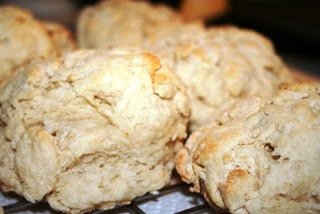 I'm thinking instead of dinner tonight, we might just have biscuits with cane syrup. And there will definitely be no crappy breakfasts this week!! !